Congratulations to Montana Cottle and Cole Bradburn for winning The 2016 Pinnacle Bank Outstanding High School Leaders Award. They were recognized at the Luncheon on Friday April 29th. Micah Yost, Vice President of Sightglass was the guest speaker for the event, who talked about the ability these leaders have to leave an impacting influence on the people around them. With this award, the students can get a $1,000 Scholarship if they decide to attend Midland University. This entry was posted in Uncategorized on May 19, 2016 by Jennifer Gepson. Driver’s Education registration will be open for resident students until may 16th, 2016. After that day, it will be open on a first -come-first-serve basis to other students. Registration booklets are in the high school office. Call the High School Office for more information at 402-468-5591. This entry was posted in Uncategorized on May 18, 2016 by Jennifer Gepson. 2nd grade has had a lot of hatching going on! This entry was posted in Uncategorized on May 17, 2016 by Jennifer Gepson. Congratulations to our State Track Qualifiers. Wish them luck at the State Meet this weekend. This entry was posted in Uncategorized on May 16, 2016 by Jennifer Gepson. 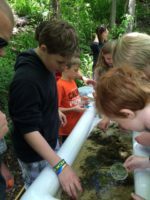 Sixth grade wrapped up their Trout in the Classroom project through Nebraska Game and Parks with a field trip to the Aksarben Aquarium on May 12th. 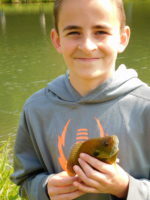 We fished, attended a presentation about Nebraska frogs, explored the education center, and hiked through the hills. The day ended with the release of over 40 rainbow trout fingerlings that we raised from the 160 eggs we received in January. This entry was posted in Uncategorized on May 15, 2016 by Jennifer Gepson. The first graders went to the Children’s Museum April 28th. They enjoyed all the museum has to offer including face painting, the balls, the grocery store, kitchen, mazes, slides, and science experiments! After the museum we headed to the Pedestrian Bridge. We ate lunch there and then were able to walk across the bridge. The kids loved seeing the views. We even got to be in two places at once (Iowa and Nebraska) by straddling the state line on the bridge. Even though it was a chilly day we still had a blast outside. This entry was posted in Uncategorized on May 10, 2016 by Jennifer Gepson. 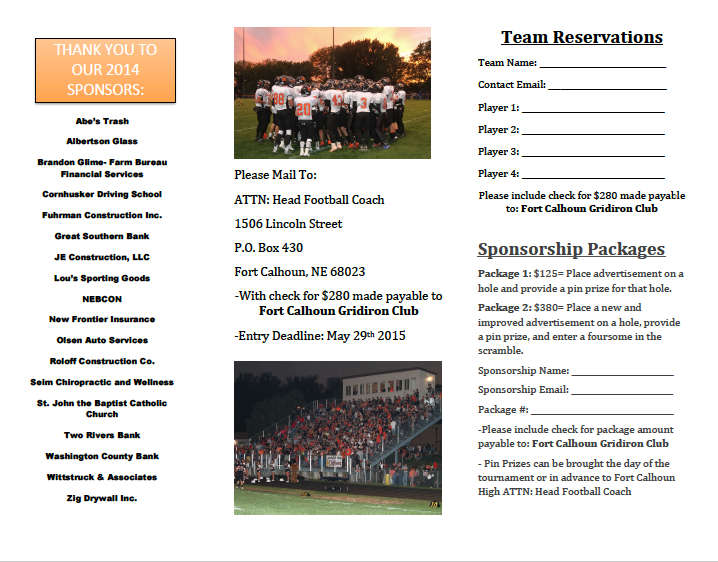 Come support the Pioneer Football Program at the 17th Annual Gridiron Golf Tournament on Friday, June 10th at River Wilds Golf Course in Blair, NE. 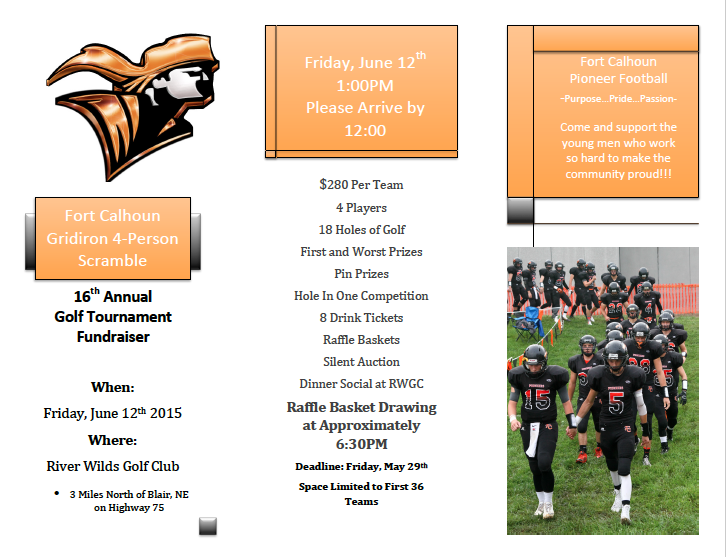 $280 will get a foursome entered for 18 holes, pin prizes, drink tickets, goodie bag, and dinner. There will also be items auctioned and raffled off during during our dinner. Shotgun start at 1:00pm! Email Coach Christensen at achristensen@ftcpioneers.org for questions or request a brochure. Thanks for your support! Congratulations Art Students!!! Our school has been chosen as one of the Top 50 schools for Vans Custom Culture! So what happens now? On Wednesday, April 27 at 8am PST, the public vote will open at vans.com/customculture. Voting is open from April 27 to May 11. You are allowed to cast one vote per region per day until voting ends at 5pm PST on May 11. Help us to get the word out so our school will advance to the Final Event on June 6-9. You can also get more information at Facebook.com/vanscustomculture. We need to thank all the contributing artists and extras, Mr. Shields for his photos, and Zane Fickbohm for the video. This entry was posted in Uncategorized on May 5, 2016 by Jennifer Gepson. Each judge at District Music Contest can select ONE performance they listened to throughout the entire contest in all classes to receive an OUTSTANDING PERFORMANCE AWARD from the NSAA. With three judges there were three awards given this year, and for the second year in a row, Fort Calhoun won two of the three awards. Congratulations to Tessa Dethlefs and Ben Bonacci on receiving these honors for their solo performances. This entry was posted in Uncategorized on May 4, 2016 by Jennifer Gepson.